The planned fivefold increase in population of its tidehead town is critical to the future of the Mahurangi watershed. If, within a couple of decades, a town of more than 20 000 has an attractive, swimmable river as the hero element of a broad linear park, the Mahurangi Harbour downstream will be well served. Left to developers, a car-centric, same-old-same-old, suburban-excuse-for-a-town would soon swamp the charm of the old Warkworth, and saddle the harbour with more sediment and road-runoff pollutants. Mahurangi Action resolved to get involved, to improve the chances that the newcomers were aware that they were the upstream residents of the first natural Hauraki Gulf harbour north of the metropolis. Clynt White joining the committee as its White Landscape and Urbanismurban-design adviser was part of that resolve. Key to the community leading planning for the future is Mahurangi Action’s initiative titled the Warkworth Town Hall Talks. The proximate incentive was the desire to have Auckland Council’s principal cultural heritage specialist, Robert Brassey, repeat his Archaeology Week lecture on the Auckland region’s first European settlement—at Mahurangi’s Gordon Browne Bay. Jannette Thompson, owner of the Mahurangi Matters, offered to help to organise the town-hall talks, on behalf of One Warkworth, and Robert’s talk is still being talked about. Next up was Ludo Campbell-Reid, Auckland Council’s official design champion and manager of the 50-strong team at the Auckland Design Office. As luck would have it, Robert Brassey works on the same floor as Auckland Council’s chief planner for everything north of the Waitematā Harbour, Warren Maclennan, which soon had the planners talking with the designers. So, not only were Warkworthians treated to an entertaining and uplifting talk by Ludo, the scene was set for Warren to kick off the 2018 season, on 14 February, with his town-hall talk, about the structure plan process, which his team commenced in earnest this month. Next up was Matthew Bloxham, friend of whitebait and foe of weirs, particularly redundant weirs such as the one at Elizabeth Street, which hasn’t served a useful purpose since 1929. It was built to supply water to the Wilson Cement Works, but has served only to thwart the upstream migration of whitebait, for the last 88 years. The only question remaining is whether a small remnant of the structure should be retained, to help tell the whitebait-and-the-weir story. The final speaker of the inaugural Warkworth Town Hall Talks season was an inspired choice. Former Saatchi & Saatchi managing director Mike Hutcheson, spoke, as a favour to former work colleague—who is now a One Warkworth luminary—on the question of how best to brand its tidehead town. Mike’s affection for the Mahurangi is genuine; he almost became a resident, before his search for the perfect mangrove-fronted property lured him to the Kaipara Harbour. If the Mahurangi was to provide him with a pied-à-terre, to have his wisdom and vision regularly on tap, it would be repaid a thousandfold. Indeed, Mike threatened to haunt the town, if it went against his advice contorting itself to produce a slogan. And his broad recommendation resonated with that of Ludo Campbell-Reid: People will visit an interesting and attractive town, regardless of branding, and they will call what they decide to call it. For about 30 of Mahurangi Action’s 43 years, the Mahurangi Coastal Trail has been its unequivocal goal. 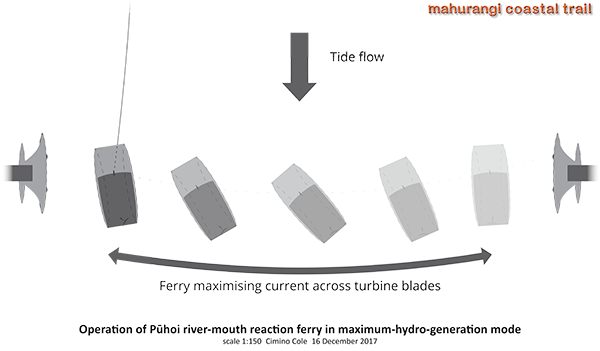 In March, or soon thereafter, its partner in the project, the Mahurangi Coastal Trail Trust, plans to lodge a resource consent application, the major component of which will address the Pūhoi River Mouth ferry operation. 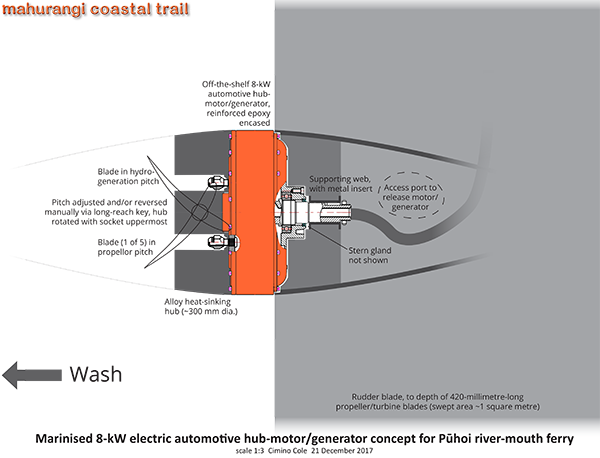 As detailed in Minimum Impact 100% River-Powered, by late 2018 the coastal trail trust plans to have major funders aboard in time to launch a short–sharp crowd-funding campaign at the 2019 Mahurangi Regatta. Crowd-willing, the Mahurangi Coastal Trail will open for the summer of 2019–2020. Serving as a practice run for the online interface of the coastal trail crowd-funding campaign, Mahurangi Action will host a fundraiser for audiovisual equipment for the Warkworth Town Hall. And, in a demonstration of how, from little things, big things grow, the last Warkworth Town Hall Talk attracted a member of the Department of Internal Affairs community-led development team, and an application to a lottery fund that the department administers, for $15 000 to kick-start the fundraising for the ~$60 000 needed.